In a past post, I described how path_helper works. As an example, I mentioned the installer for Python 3 which runs a postinstall script that locates and modifies the current user’s shell profile file to add the Python 3 binary directory to the PATH. Not only is modifying a user’s file a horrible practice, but it will not achieve the desired purpose when the user installing the package is ultimately not the user using the system. This setup happens fairly frequently in managed deployment workflows. As described in the earlier post, macOS will add the contents of files in /etc/paths.d/ to all users’ PATHs. So, all we have to do is create a file with the path to the Python 3 binary directory in /etc/paths.d/. A perfect task for a simple installer package. This is not so hard. However, since the path to binary contains the major and minor version number, you will have to create a new version when Python 3 updates to 3.8 (and 3.9, etc…). So, it makes sense to script the process. With a package this simple, you can create everything required to build the package (i.e. the payload folder with contents) from the script in a temporary directory and then discard it after building. You can find my script at this Github repository. Note: when you modify the PATH with path_helper, your additions will be appended. The Python 3 installer prepends to the PATH. This might lead to slightly different behavior, as the Python 3 behavior overrides any system binaries. If you want to prepend for every user, you have to modify the /etc/paths file. There are a few other simple installers where this approach makes sense. I also made a script that builds a package to create the .AppleSetupDone file in /var/db to suppress showing the setup assistant at first boot. Since I was planning to use this with the startosinstall --installpackage option, this script builds a product archive, rather than a flat component package. You could create this package once and hold on to it whenever you need it again, but I seem to keep losing the pkg files. The script allows you to easily re-build the package in a different format or sign it when necessary. Also, dealing with the invisible file is a bit easier when you just create them on demand. The last example creates a single invisible file .RunLanguageChooserToo, also in /var/db/. This will show an additional dialog before the Setup Assistant to choose the system language. MacAdmins might want to have this dialog for the obvious reason, but it also allows for a useful hack. When you invoke the Terminal at the Language Chooser with ctrl-option-command-T it will have root privileges, which allows some interesting workflows. With this package the creation of the flag file happens too late to actually show the chooser. So I added the necessary PackageInfo flags to make the installer require a restart. Note that startosinstall will only respect this flag with a Mojave installer, not with High Sierra. These three scripts can be used as templates for many similar use cases. As your needs get more complex, you should move to pkgbuild scripts with a payload folder, munkipkg, or Whitebox Packages. As MacAdmins our goal is to automate workflows when ever possible. The advantages of automation are great. You immediately reduce the workload, but also reduce the potential for someone to make a mistake, which would mean even more work later. In nearly all cases, we want the automation to happen “magically” in the background, without any user interaction. User interaction slows down the process as the script is waiting for the user to confirm or enter data. User input also requires validating and checking user entered data. In most cases, when you believe you need to prompt the user for, well, anything, you should take that moment to re-think your workflow. Maybe you can come up with a different workflow that can provide the data from a source that can be automated without user interaction. If, however, you really are convinced that user interaction is necessary, then you need be aware there are many potential pitfalls in writing shell scripts with user interaction. macOS Mojave will introduce even more pitfalls with its increased security features. Do you really need UI? A common example for user interaction is to get and set the Computer Name or Asset Tag/ID/Number from manual input. This is a task that can be fully automated in many situations. As an admin you could provide a text file mapping serial numbers to a name and/or asset tag on a server, that a script can download (curl) and parse. If you have a management system or asset database, there is probably an XML or JSON API, you can use to retrieve this information from a script. You could read or scan the serial numbers from the labels of the Mac’s boxes or even get the list with the purchase order from most vendors. With that data you can pre-fill your text files or databases. However, in some cases, especially DEP workflows it may be difficult or impossible to predict which computer will end up on which desk, especially with zero-touch deployment workflows, where a device can be sent to a user directly. In this case, you have to question whether you need a unique, specific computer name or asset tag. Maybe the data which your management system already gathers, such as the user who enrolled the device and its serial number will (have to) be sufficient? In many cases, however, the reasons to prompt for and set a computer name will not be technical but stem from other, external factors that the IT department may or may not have influence on. bash was built to run in a text based terminal on many different operating systems. It has (and should have) no concept of a graphical user interface. bash alone is not useful to interact with the user, unless you want to open a terminal window. There are other tools that allow to display user interface from a shell script. However, they all require an additional installation. AppleScript/osascript is simpler and built-in to the OS, so it is my first choice. That doesn’t mean it is always the appropriate choice, though. The display dialog AppleScript command is documented in the “StandardAdditions” dictionary. You can see it when you choose ‘Open Dictionary…’ from the File Menu in Script Editor. Then select the “Scripting Additions.osax” dictionary and choose the “User Interaction” category. The choice variable will be No or Yes. Will show the current application’s icon. You can also use stop or caution for different icons. display dialog "Hello!" with icon POSIX file "/Applications/Notes.app/Contents/Resources/AppIcon.icns"
display dialog "Who are you?" default answer "nobody"
display dialog "Who are you?" default answer ""
You can combine the default answer argument with all the above arguments as well. display notification "Hello, again" with title "Hello"
You can execute AppleScript from the shell with the osascript command. osascript -e "display dialog \"What's up?\" with title \"$title\""
When you use variable substitution, you have to use double quotes for the command strings. And then you have to escape any additional double quotes in the AppleScript command. With more complex commands and arguments this will get unwieldy very quickly. display dialog "What's Up?" with title "$title"
You start a here document with the <<- characters followed by a limit string of your choice (I chose EndOfScript). Then all the text until the limit string is repeated will be fed into the osascript command. Bash variables will be substituted in the here document, so $title will be substituted with its contents. 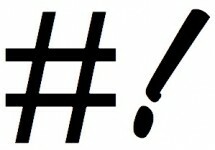 Note: I prefer the <<- syntax over the << syntax with osascript. The <<- syntax will ignore leading white space in the following lines, allowing me to properly indent the AppleScript code, making the entire script more legible. Management scripts will run with root privileges. They may also be run in situations where no user is logged in. AppleScript requires a user to be logged in (and a window server to be present) to display the alert. In many situations all of this will ‘just work’ even when the script is executed from a root process, in others, the script will fail. It is generally safer to always check the current user and run the osascript command as the currently logged in user. You can learn about how and why to do this in this article on ‘Root and Scripting’. This also gives your script an option to continue silently or fail when no user is logged in. launchctl asuser $uid /usr/bin/osascript -e "button returned of (display dialog \"Hello\")"
While all of these examples are simple enough, you can already see that, once you consider all the possible combinations, everything will get fairly complex. The reason for this is that it will ensure that the dialog is displayed on top of all other windows. The activate command will push the targeted process to the front. Both “System Events” and “Finder” are used frequently. In most cases this is not necessary, as the dialog will properly display on top of all other windows, even as a standalone command. There may be some weird conditions when other applications are launched in the same time frame, though. In other cases it may be better to use display notification, anyway. 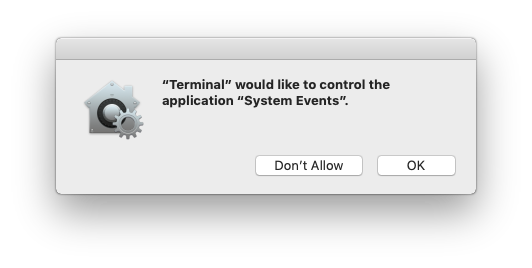 In macOS Mojave, Apple Events (AppleScript Commands) can only be sent to another application with user permission. Once a user has denied access, they will not be prompted again. 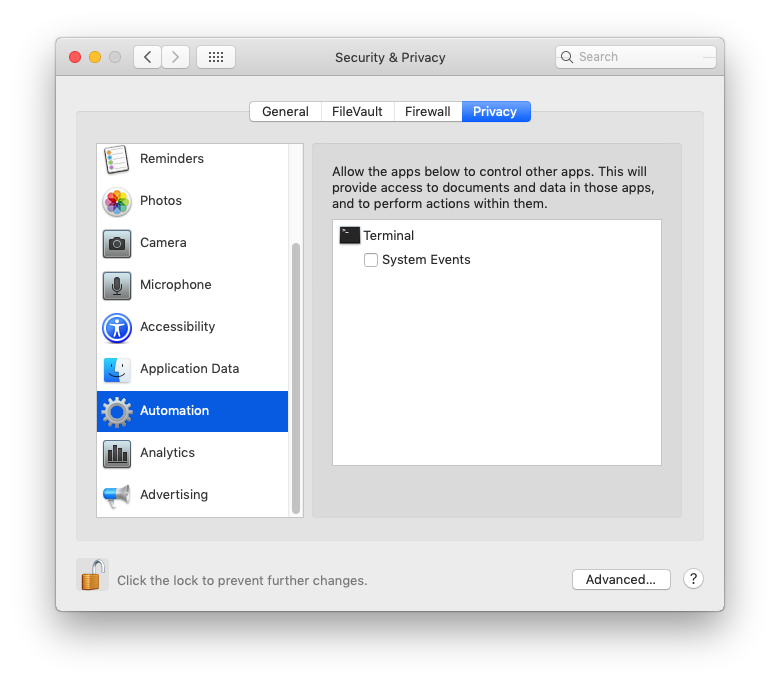 They will have to go to the ‘Privacy’ tab in the ‘Security & Privacy’ pane in System Preferences, search for ‘Automation’ and allow access for Terminal. However, management scripts will usually not be executed from Terminal, but from within the context of an installation script or management agent. It may be possible to pre-approve configurations with a UAMDM configuration profile, but it will be impossible to anticipate all contexts in which your scripts may run. All of these wrapped commands in scripts will break in macOS Mojave! MacAdmins need to go through all their management scripts and check for AppleScript UI commands wrapped in tell statements. When you use the standalone display dialog it will be the AppleScript process itself that displays the dialog. This requires no specific permission. Even if your dialogs may not appear on top of all the windows, this is a preferable solution. This will also affect scripts using osascript to control or receive data from other applications.